Avery | Beer Apprentice - Craft Beer News, Reviews, Interviews and Info. Hi guys. For today’s craft beer review I’m going to be trying the Joe’s Premium American Pilsner produced by the Avery Brewing Company located in Boulder, Colorado. I’ve been drinking this beer like crazy this Summer, so I figured I better give it a proper review. From the website, averybrewing.com, I found a bit of information about this Pilsner. A contemporary rendition of a classic style, Joe’s is hopped with purpose: beautifully bitter and dry with an abundance of floral, Noble German hops. Über sessionable. Utterly American. This is Premium American Pilsner. This particular beer came in a 12 oz. can and it had an ABV of 4.7%. It poured a clear yellow color with white gold highlights shimmering around the edges. The cap was bright white, decently sized with a soapy, but smooth and consistent texture. The retention time was pretty good and the lacing wasn’t too bad either. The nose seemed a little more boisterous than most American Pilsners that I’ve tried. It released nice hints of fresh pear along with some tones of lemongrass. Wafts of fresh grains and soft floral notes complimented scents of crisp crackers and fresh biscuits. It was well balanced and pleasant all the way around. The first thing I noticed about the taste was the very nice hop bite and bitterness I received. A decent amount of pear and lemon citrus intermingled with a light spiciness while a clean malt backbone of typical grains, grasses, fresh breads and biscuits smoothed the overall profile. Like the aroma, the flavor was very well balanced and harmonized. I liked it. The mouthfeel was medium to medium/thin. It was extremely smooth, crisp, refreshing and thirst quenching. It was also, surprisingly, fairly dry. The carbonation was of medium strength and a solid shot of flavor was left behind after each gulp. I’ll tell ya. I really like this beer. It’s one of the better American Pilsners in my opinion. Obviously, it would be great for Spring and Summer and it’s absolutely perfect for a lawnmower beer, however I could see myself grabbing this from time to time throughout the year. It’s super easy to drink. As I mentioned earlier, it’s very refreshing and thirst quenching, but it still has plenty of character and hop bite for some serious enjoyment. Actually, I prefer this straight out of the can, yet it’s still not bad at all in a glass. I can absolutely kill these things on a hot day. 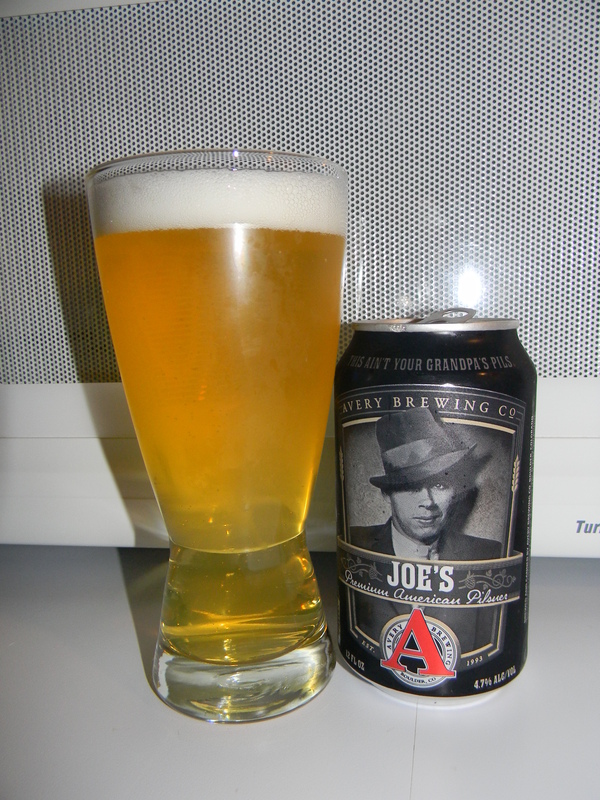 Have you guys tried the Avery Joe’s Premium American Pilsner? What did you think of it? Feel free to leave a comment and tell me all about it if you’d like. Thanks for checking back in on another review folks. I really appreciate it. Hello everyone. It’s time for another craft beer review and I want to thank you for stopping by for a few moments to join me. 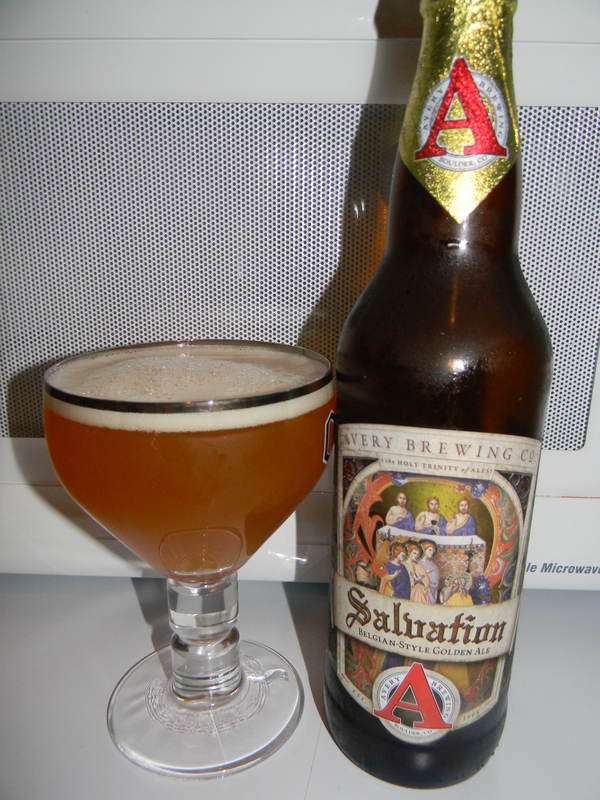 Today, I’m going to be trying the Avery Salvation produced by the Avery Brewing Company located in Boulder, Colorado. Let’s go ahead and jump over to the website, averybrewing.com, and see what kind of information we can find about this beer. The success of Hog Heaven and The Reverend clearly demonstrates that beer drinkers are willing to embrace “BIGGER” beers. In the fall of 2001, we decided that a lighter BIG BEER would complement its darker-colored predecessors. Luscious apricot and peach aromas are delicately interwoven with spicy suggestions of nutmeg and cinnamon in this heavenly soft, champagne-like elixir. This brew came in a 22 oz. bottle and it possessed an ABV of 9.0%. It poured a hazy, golden/orange color. The crown was barely off white, kind of small, fizzy and soapy. Both the retention time and the lacing were slight. Hmm. I was a little disappointed with the overall appearance of this brew to be honest. The nose released tones of some sugary orange juice along with some spicy clove. Some Belgian yeast was found as well as some fruity pear and peach. The nose wasn’t extremely robust, however it was balanced well and proper for the style. The taste brought forth more of the pear, peach and light orange juice flavoring. Very light yeastiness and some sweet malt. The spice seemed quite muted too. What spice that was found was of the clove and white pepper variety instead of the cinnamon and nutmeg that the description suggested. The mouthfeel was medium bodied. A bit watery, but smooth and crisp. A very minor amount of warmth was felt and some good carbonation was to be had. An ok amount of goodness was left behind after the swallow also. Overall, I thought this was a decent beer. It wasn’t anything spectacular, yet it was nothing bad or off putting either. I guess I just figured that it would be a little bit more forceful in both the nose and the taste. It did seem to follow the style fairly well though. Either way, the drinkability was still rather good and it would be worth a try if you have yet to do so. Have you guys every tried this beer? What did you think of it? How’s it going guys? It’s time for another craft beer review and for today’s enjoyment I’m going to be tasting the Avery IPA produced by the Avery Brewing Company located in Boulder, Colorado. I’ve always enjoyed this IPA and I try to pick it up every so often to just have in the fridge when the urge for an IPA hits. From the website, averybrewing.com, I copied this description of the Avery IPA. In the 1700s one crafty brewer discovered that a healthy dose of hops and an increased alcohol content preserved his ales during the long voyage to India (as depicted in our label) to quench the thirst of British troops. Today, we tip our hat to that historic innovation by brewing Colorado’s hoppiest pale ale. Avery IPA demands to be poured into your favorite glass to truly appreciate the citrusy, floral bouquet and the rich, malty finish. I’m getting thirsty. Let’s drink. This beer came in a 12 oz. can and it had an ABV of 6.5%. It poured a relatively clear golden to orange color. The head was white, fluffy, soft and mildly rocky. It was sized very well and the retention time was good. The lacing was more than solid too. A very attractive beer to my eye. The nose popped with some grapefruit citrus followed by a small waft of red apple skins. A lot of floral components as well. Some resiny goodness was found intermingled with a clean breadiness and light caramel malts. Overall, nothing too crazy, but well balanced and proper for an IPA. The taste jumped with more of that grapefruit citrus. Again, simplistic in the fact that it provided expected tones of caramel malt, suitable breadiness and sticky resin. It got a bit earthy as it warmed and as I neared the end of the can. It was nicely congruent all the way through though. The mouthfeel was medium bodied. Mostly smooth, but with some crispness. Quite dry, yet refreshing at the same time. A good medium strength carbonation allowed a sturdy dose of flavor to be left behind on the palate between sips. Like I said earlier, this is an IPA that I always enjoy drinking and try to have available throughout the Spring and Summer. It’s not going to blow away that crazy “hophead”, however it does have enough of that personality to satisfy in my opinion. It does become more malty toward the end, but in my mind, that only helps balance and round it off. It’s a “go-to” for me that’s for sure. Super easy to down. So, if you guys are looking for a solid IPA that could be an everyday drinker…. give the Avery IPA a try. I think you may be pleasantly surprised.